The Tecno R7 Smartphone is one of the greatest tecno products that arrives at an affordable price, that is, over 90% of Smartphone users can afford it. Without much say, I would quickly highlight three Reasons you should buy the Tecno R7 Smartphone. 3 Reasons You Should Buy The Tecno R7 Smartphone. 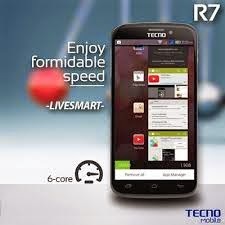 Of course, the features and Specifications of the Tecno R7 Smartphone is more unique than the other tecno products. It's a very awesome smartphone like I've always said, that is powered with a 6-core Processors clocked at 1.5GHz with a 2GB RAM, which makes it pretty cool for Mobile Gaming, and it also enables the OTA (Over the air) updates, which enables easy upgrade of it's Operating system, whenever there is an avaliable update. It's internal Memory has a Storage ROM of 16GB and RAM of 2GB, isn't it cool? For those who loves taking pictures durning special events or occassion, the Tecno R7 Smartphone can also oblige, because it's camera is of 13 Mega Pixel with display of upto 4128x3096 Pixel Picture with an active LED Flash. It's Front camera(Secondary) is 5 Mega Pixel with Display upto 2592x1944 Pixel Pictures, It's very much compatible for webcam and video calls (i.e Skype), and many more basic features. 2. It's Easy to Root. Nowadays, most android users find it difficult to root their android smartphones due to the lenghty task in rooting it, and also the risk taken to root it. Most Android smartphones do need the help of computers, in other to get rooted. You can take a stroll to our rooting resolution center, where all procedures for rooting any android smartphone is exposed, and you would notice that most rooting procedure explained there is task demanding. 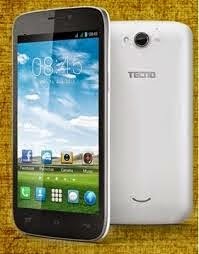 But in the case of the tecno R7 Smartphone, the rooting procedure is very easy and no computer is needed for rooting it. You can Know more about rooting Tecno R7 Smartphone Here. 3. It's Very Cheap And Affordable. Other Android Smartphones that achieves most of these specification that the Tecno R7 Smartphone acquires, are very much expensive, but the tecno R7 Smartphone is very cheap and affordable. The price tag of the Tecno R7 Smartphone is between 40K to 45K in Naira. I'd recommend the tecno R7 Smartphone for anyone looking to buy a powerful, stylish and Sophisticated Smartphone. You can get it at cheaper rates with free accessories at Konga. Once you've purchased the smartphone from any of the e-commerce sites mentioned above, then provide them with your residence address, and the Smartphone would arrive to your door stop. Purchases can be simply done with the use of your ATM card. 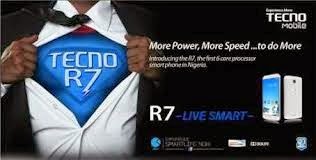 Hi Nonso, I've been watching your post about this Tecno R7 lately. Are you a fan of the Chinese company too? Lol, Babatunde.. I started my 1st review with the Tecno R7 Smartphone, and I have tested the device, is really one of the best tecno product.. The link you put up there to Konga is broken. Would you check it and correct?